Diabetes mellitus type 2 (DMT2) is a metabolic disease characterized by a chronic increase in glycemia that promotes several long-term complications and high mortality. Some enzymes involved in glycaemic control, such as α -(1,4)-glucosidase, have now been established as novel pharmacological targets. Coumarins have shown benefits in attenuating signs and complications of DMT2, including inhibition of this enzyme. In this work, new synthetic coumarins (bearing different amide and aryl substituents) were studied in vitro as inhibitors of α-(1,4)-glucosidase. Among them, five molecules proved to be excellent α-(1,4)-glucosidase inhibitors, being compound 7 (IC50 = 2.19 µM) about 200 times more potent than acarbose, a drug currently used for the treatment of DMT2. In addition, most of the coumarins presented uncompetitive inhibition for the α-(1,4)-glucosidase. 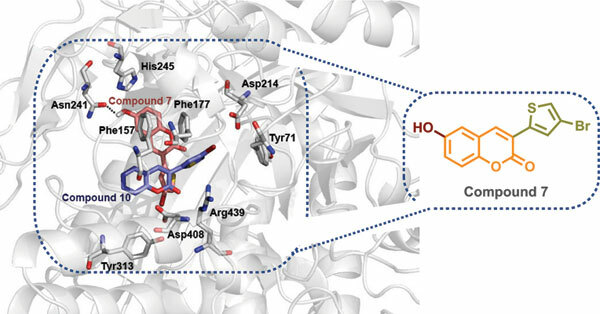 Molecular docking studies revealed that coumarins bind to the active site of the enzyme in a more external area comparing to the substrate, without interfering with it, and displaying aromatic and hydrophobic interactions, as well as some hydrogen bonds. According to the results, aromatic interactions with two phenylalanine residues, 157 and 177, were the most common among the studied coumarins. This study is a step forward for the understanding of coumarins as potential anti-diabetic compounds displaying α-(1,4)-glucosidase inhibition. Coumarins, Diabetes mellitus, α-(1, 4)-glucosidase inhibition, Docking studies, Medicinal chemistry, DMT2.